2012 Ford with airbags (front and side), air conditioning, sunroof. White with black interior. 2017 Ford Raptor price AED 262,000, with power seats with memory, navigation system, parking sensor rear. It has black interior and is Black. 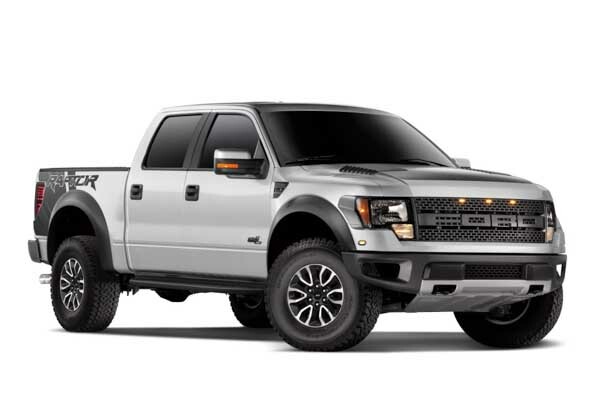 GCC spec 2017 Ford Raptor, grey/silver pick up truck with black interior. It features climate control, 17 inch wheels and power windows. 2018 Ford with 4WD, CD player, MP3 interface. Black with black interior. Blue 2017 6 cylinder pick up truck. Black interior. It has hill descent control and DVD-player. GCC spec Ford Raptor with Power windows, 20″ wheels and Leather seats. Price reduced! Automatic Ford Raptor with 17 inch wheels, DVD-player, alarm, grey/silver on the outside, grey interior. GCC spec 2013 Ford with Tuner/radio, 19″ wheels and Power windows. Price reduced! Ahmed - My import second hand Ford Raptor is a beast when I go to the desert on the weekends all my friends want to drive it, but I only let them ride shotgun. Nothing gets in the way, and the Raptor SVT can get over any terrain. Pros: Offroad abilities and options. Kevin - Took me some time to find a used Ford Raptor for sale in Dubai, UAE, but when I did, I just had to buy it. I love off road driving, and nothing can match the power and looks of this beast! Pros: Power, looks and options. Peter - Just epic cars these are, nothing compares to a pre-owned SVT Raptor. Not only is it powerful enough to tow four quad bikes to the UAE deserts, but it's also got all the options I need to keep the kids entertained during the long drive from Dubai to Hatta. Pros: Presence, power and options. Cons: Parking in malls is hard. No terrain can take down a second-hand Ford Raptor for sale in Dubai, UAE, with its massive ground clearance and huge off-road tyres, traversing the desert is too easy in the Raptor. Its sheer size of these cars is only matched with its engine. In top trim is a powerful 6.2-litre V8 producing momentous amounts of power and torque. That engine isn’t just for growling, with it equipped, up to 3,638 kilos can be attached to the rear end and towed away! That's one and a half Bentley Continentals! Just because it’s built to tackle the great outdoors doesn't mean you can’t have a little luxury inside. In all fairness, it doesn’t have any rivals meaning no competition. Based on the Ford F150 platform, the Raptor targets of off-road enthusiasts that don’t need a roof to keep their camping gear down just a couple of ropes will suffice. With the heart of a Trophy truck not only can it tackle any terrain it traverses, but it can also prove useful on asphalt. Not many can compare when it comes to rivals. However, the Dodge Ram, Toyota Tundra and Chevrolet Silverado should produce a worthy competitor. Debuting in 2010, around the world and in 2011 in the GCC as a particular order. Basic features include fabric seats, CD player and power accessories. Extras include a Sony sound system, leather seats, power seats, media inputs, Bluetooth options, navigation, unique rims, xenon and LED headlights. Third party kits include roof mounted fog lamps; Trophy Truck inspired body, brush guard and rear parking sensors. These monstrous offroaders are powered by a 5.4-litre petrol V8 motor in export markets; GCC residents have the 6.2-litre V8 option pumping at 411 horsepower. Driving all four wheels via a 6-speed automatic gearbox. Fox Racing shocks, massive off road rims with 35-inch of rubber and a rear differential locking gear with a ratio of 4.10:1 as standard. Four exclusive paint scheme are available to coat the exterior; Molten Orange, Oxford White, Tuxedo Balck and Blue Flame. A digitally printed ‘mud splat’ decal is an optional extra. A Ford SVT Raptor R is available exclusively for off-road racing. In 2011, the 5.4-litre motor was dropped leaving the SVT 6.2L engine to power all four wheels. Ingot Silver Metallic is added to the exterior paint schemes and a four door super cab edition was made available. 2012 models remained identical with the front differential being replaced by a Torsen helical gear limited slip differential. 2013 and 2014 models remain equal. Not much changed throughout the years except for around two (2015 and 2016) of them where the Raptor was put on a brief hiatus. 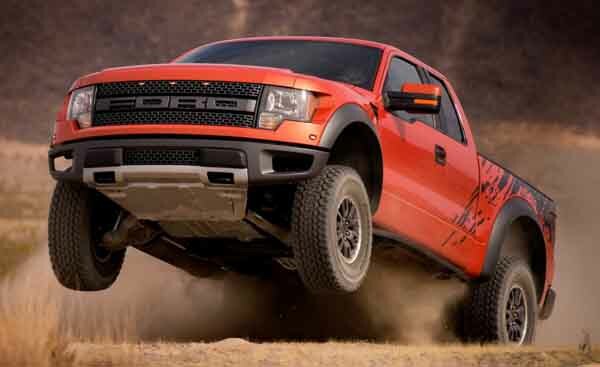 Looking to buy used Ford Raptor in Dubai, UAE? The price starts at around AED 95,000. 2017 marks the return of the Raptor with an all new face which follows the exact design as standard F-150s. Standard specifications inside and out are 100% confirmed. However, it’s more than likely that previous model. What is known is the 17-inch aluminium rims, Fox racing shocks and halogen headlights. Built on a steel chassis, the entire body is comprised of lightweight materials such as aluminium which reduces overall weight by 227 kgs. SuperCrew and SuperCab models are both available with no Blue oval mounted on the front end instead Ford is plastered across the grille in large font. Ford revised the off-road abilities of the beast by fitting a torque on demand transfer case, racing shock absorbers, new all terrain tires and rims. 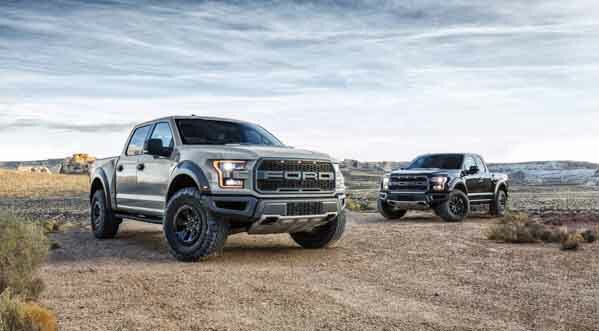 The new generation of Raptor’s is now powered by a 3.5-litre V6 twin-turbo EcoBoost engine hooked up to a brand new 10-speed automatic gearbox. Now I know what you are thinking, the power output is going to be so much smaller, BOO! It’s the polar opposite, generating over 500 horsepower!